In the last decade, we have discovered thousands of planets outside our solar system and have learned that rocky, temperate worlds are numerous in our galaxy. The next step will involve asking even bigger questions. Could some of these planets host life? And if so, will we be able to recognize life elsewhere if we see it? A group of leading researchers in astronomy, biology and geology has come together under NASA’s Nexus for Exoplanet System Science, or NExSS, to take stock of our knowledge in the search for life on distant planets and to lay the groundwork for moving the related sciences forward. “We’re moving from theorizing about life elsewhere in our galaxy to a robust science that will eventually give us the answer we seek to that profound question: Are we alone?” said Martin Still, an exoplanet scientist at NASA Headquarters, Washington. In a set of five review papers published last week in the scientific journal Astrobiology, NExSS scientists took an inventory of the most promising signs of life, called biosignatures. The paper authors include four scientists from NASA’s Jet Propulsion Laboratory in Pasadena, California. They considered how to interpret the presence of biosignatures, should we detect them on distant worlds. A primary concern is ensuring the science is strong enough to distinguish a living world from a barren planet masquerading as one. The assessment comes as a new generation of space and ground-based telescopes are in development. NASA’s James Webb Space Telescope will characterize the atmospheres of some of the first small, rocky planets. There are plans for other observatories — such as the Giant Magellan Telescope and the Extremely Large Telescope, both in Chile — to carry sophisticated instruments capable of detecting the first biosignatures on faraway worlds. Through their work with NExSS, scientists aim to identify the instruments needed to detect potential life for future NASA flagship missions. The detection of atmospheric signatures of a few potentially habitable planets may possibly come before 2030, although determining whether the planets are truly habitable or have life will require more in-depth study. These kinds of biosignatures can all be seen on our fertile Earth from space, but the new worlds we examine will differ significantly. For example, many of the promising planets we have found are around cooler stars, which emit light in the infrared spectrum, unlike our sun’s high emissions of visible-light. The scientists assert that oxygen — the gas produced by photosynthetic organisms on Earth — remains the most promising biosignature of life elsewhere, but it is not foolproof. Abiotic processes on a planet could also generate oxygen. Conversely, a planet lacking detectable levels of oxygen could still be alive – which was exactly the case of Earth before the global accumulation of oxygen in the atmosphere. Researchers with the University of Washington-led Virtual Planetary Laboratory are central to a group of papers published by NASA researchers in the journal Astrobiology outlining the history — and suggesting the future — of the search for life on exoplanets, or those orbiting stars other than the sun. A theme through the research and the discussions behind it is the need to consider planets in an integrated way, involving multiple disciplines and perspectives. Work done by NExSS researchers will help identify the measurements and instruments needed to search for life using future NASA flagship missions. The detection of atmospheric signatures of a few potentially habitable planets may possibly come before 2030, although whether the planets are truly habitable or have life will require more in-depth study. The papers result from two years of effort by some of the world’s leading researchers in astrobiology, planetary science, Earth science, heliophysics, astrophysics, chemistry and biology, including several from the UW and the Virtual Planetary Laboratory, or VPL. The coordinated work was born of online meetings and an in-person workshop held in Seattle in July of 2016. The pace of exoplanet discoveries has been rapid, with over 3,700 detected since 1992. 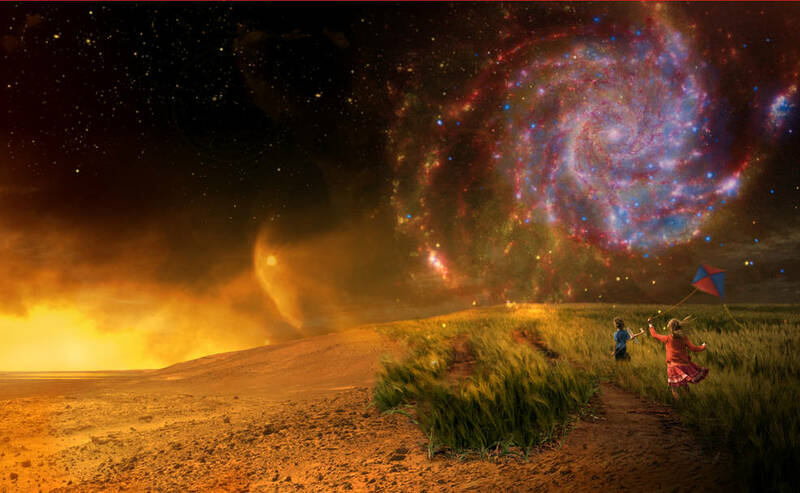 NASA formed the international NExSS network to focus a variety of disciplines on understanding how we can characterize and eventually search for signs of life, called biosignatures, on exoplanets. The first of the papers [links for all papers are below] reviews types of signatures astrobiologists have proposed as ways to identify life on an exoplanet. Scientists plan to look for two major types of signals: One is in the form of gases that life produces, such as oxygen made by plants or photosynthetic microbes. The other could come from the light reflected by life itself, such as the color of leaves or pigments. Such signatures can be seen on Earth from orbit, and astronomers are studying designs of telescope concepts that may be able to detect them on planets around nearby stars. Meadows is a co-author, and lead author is Edward Schwieterman, a VPL team member who earned his doctorate in astronomy and astrobiology from the UW and is now a post-doctoral researcher at the University of California, Riverside. Meadows is lead author of the second review paper, which discusses recent research on “false positives” and “false negatives” for biosignatures, or ways nature could “trick” scientists into thinking a planet without life was alive, or vice versa. In this paper, Meadows and co-authors review ways that a planet could make oxygen abiotically, or without the presence of life, and how planets with life may not have the signature of oxygen that is abundant on modern-day Earth. Schwieterman is a co-author on this paper, as well as UW doctoral students Jacob Lustig-Yaeger, Russell Deitrick and Andrew Lincowski. With such advance thinking, scientists are now better prepared to distinguish false positives from planets that truly do host life. Two more papers show how scientists try to formalize the lessons we have learned from Earth, and expand them to the wide diversity of worlds we have yet to discover. David Catling, UW professor of Earth and space sciences, is lead author on a paper that proposes a framework for assessing exoplanet biosignatures, considering such variables as the chemicals in the planet’s atmosphere, the presence of oceans and continents and the world’s overall climate. Doctoral student Joshua Krissansen-Totton is a co-author. By combining all this information in systematic ways, scientists can analyze whether data from a planet can be better explained statistically by the presence of life, or its absence. The data that astronomers collect on exoplanets will be sparse. They will not have samples from these distant worlds, and in many cases will study the planet as a single point of light. By analyzing these fingerprints of atmospheric gases and surfaces embedded in that light, they will discern as much as possible about the properties of that exoplanet. The final article discusses the ground-based and space-based telescopes that astronomers will use to search for life beyond the solar system. This includes a variety of observatories, from those in operation today to ones that will be built decades in the future. Taken together, this cluster of papers explains how the exoplanet community will evolve from their current assessments of the sizes and orbits of these faraway worlds, to thorough analysis of their chemical composition and eventually whether they harbor life. “I’m excited to see how this research progresses over the coming decades,” said Shawn Domagal-Goldman, an astrobiologist at NASA’s Goddard Space Flight Center, Greenbelt, Maryland, and a VPL team member. He is also a co-author on four of the five papers. NExSS is an interdisciplinary, cross-divisional NASA research coordination network. See the full U Washington article here . The 3-day workshop is bringing together some 50 scientists ranging from astronomers, astrobiologists and planetary scientists to microbiologists and specialists in photosynthesis. Organized by NASA’s Nexus for Exoplanet System Science (NExSS) — an initiative created to encourage interdisciplinary collaboration — it has been tasked with putting together a report for the larger exoplanet community and ultimately for NASA. Because the science of remote biosignatures is still in its early stages, the unknowns can seem to overwhelm the knowns, making the whole endeavor seem near impossible. After all, it’s proven extremely difficult to determine whether there was ever life on “nearby” Mars, and scientists have Martian meteorites to study and rovers sending back information about the geology, the geochemistry, the weather, the atmospheric conditions and the composition of the planet. That’s why Mary Voytek, the originator of NExSS and the head of the NASA astrobiology program, said at the workshop that the goal was to test and ultimately provide as many biosignatures as possible. She wants many molecules potentially associated with life to be identified and then studied and restudied in the same critical way that oxygen has been — embraced for the biosignature possibilities it offers, and understood for the false positives and false negatives that might mislead. I’m most excited to join NExSS at its one year anniversary, and hope that I can help the network as it advances into, and works to fashion, the exoplanetary future. Coming in from the outside, the progress I already see in terms of bringing researchers together to work on interdisciplinary exoplanet science is impressive. But more generally, I see this as a significant juncture in the fast-expanding study of these distant worlds, with NExSS and its members poised to facilitate a potentially revolution in how we look at planets in this solar system and beyond. The ‘systems science’ approach to understanding exoplanets is, I believe, the right framework for advancing our understanding. Earth scientists and biogeochemists have been using systems science for some time now to build, test, and improve theories for how the Earth functions as an interconnected system of physical, chemical and biological components — all operating over eons in a complex and tangled evolutionary web that we are only now unraveling. It is this method that allows us to better understand the respective roles of the atmosphere, ocean, biosphere, and geosphere in influencing the past and present climate of this planet. It allows us to clearly see the damage we are causing to these systems through the release of industry and transport-created greenhouse gases, and offers opportunities for mitigation. We know the systems science approach works for the Earth, and the time to make it work for exoplanets is now. But as Marc pointed out in his previous post about the first year of NExSS, the opportunity to leverage this method for comparative planetology is a relatively new one. We just haven’t had the data for building exoplanet systems models and making testable hypotheses. The work that NExSS is doing is extremely relevant to this effort because we recognize that – faced with the gargantuan task of discerning how innumerable planets beyond our solar system can be found, formed, characterized and understood — we have to do something different. The decisions we make and the effort we invest at this still very early stage will determine the future of planet discovery, and build the foundations for how we come to understand the planet system and its evolution. We are likely the first of many generations of interdisciplinary exoplanetologists. To build a sturdy foundation for this approach, we will need to further break down the often restrictive scientific “stovepipes” that can keep necessary data known to scientists in one field from others who need it to understand their own data. After the stovepipes have been dismantled (or at least modified), then comes the process of together building the exoplanetary chimney. This is not an effort that can be successfully undertaken by individuals alone, or even already formed cross-disciplinary groups. By its very nature, exoplanet science needs the insights and energy of the entire community of astrophysicists, heliophysicists, Earth scientists and planetary scientists interested in how their particular field of study fits in to the grand picture beginning to take shape. Planets are endlessly complex and dynamic islands at the confluence of the physical, chemical and biological realms, and therefore our approach to making sense of them must be interdisciplinary, inclusive and epistemologically unique. I’ve always thought, naively perhaps, of the search for exoplanets and for other life in the universe as a proxy search for our own place. With our telescopes we peer ever outward, trying to find other worlds like our own to give meaning to that which we know best – this planet and its biosphere. It’s the next inevitably tumultuous battle in the long and sustained campaign for a greater perspective on ourselves, one that began when we first looked up at the night sky and wondered if what was out there was anything like what was down here. It’s difficult, of course, to see how far you’ve already traveled on a journey of unknown length. But his field has come so far already and made so many strides in the last twenty years that analogies to its pace of discovery are difficult to come by. As for me, I come from a biogeochemical background and was schooled at the University of East Anglia the UK. I spent my PhD years building models to investigate how the planetary evolution of Earth and Earth-like planets may affect their long-term habitability. But I have also dedicated much time to telling just about anyone who would listen just how very cool exoplanets are. I hope to continue this work too. During my exoplanet talks in the UK – at meetings, science cafes, outreach events, at the pub and online through my blog — I can honestly say I’ve never encountered anyone who didn’t find this science fascinating. Whatever my own speaking skills may be, I know that it’s not difficult to enthuse people about the idea of exotic planets, alien life, and space missions. It’s almost cheating. There’s an optimism inherent in the field – one that says we can learn about these distant, shrouded and endlessly complex planetary systems through our own hard work, cleverness and technology. I think it’s an optimism that people relate to. I hope therefore to make some small contribution to this effort through my time with NExSS by helping to build and maintain future and current collaborations among our existing members, growing our network, helping with our upcoming meetings and workshops, and facilitating communication from the network and its members. I look forward to both embracing the differences, and identifying the similarities, between my training in the UK and the research culture here in USA. I think other countries would benefit greatly from the ‘NExSS approach’, and I look forward to welcoming the input of international colleagues in making NExSS a truly global enterprise. Many countries may be looking to NExSS’s example: let’s lead the way in showing the world how best to find and understand other worlds. In addition to on-going PI collaborations, NExSS has some exciting plans for the year ahead, as well as some tasks with significant and formal purposes. First is the NExSS Exoplanet Biosignatures Workshop Without Walls in Seattle in July, which will have 30-35 on-site participants and an opportunity for many more to participate online. Insights and conclusions from the Biosignatures Workshop will be exchanged with NASA’s Science Technology Definition Teams (STDTs) for upcoming planet-observing missions. In addition, summary reports from the workshop will be circulated to the community for feedback. These reports will then be filed with a dedicated Exoplanet Biosignatures Study Analysis Group (SAG 16) of the Exoplanet Exploration Program Analysis Group (ExoPAG). A heliophysics-based workshop (title and details tbc) will also be held in November, with title and details to be announced. The second Face-to-Face meeting of all 17 NExSS PIs and associated team members, Co-leads, and NASA HQ representatives will be held at NASA Headquarters and the Carnegie Institution for Science in May. The two-day event offers an opportunity to discuss what worked and what didn’t work so well during the first year of NExSS, to hopefully come up with new collaborations, and to look ahead to the future of the network. Over the next two years, the initiative will also continue to engage with the wider exoplanet community through workshops, meetings, and outreach activities in order to grow the network organically while ensuring inclusivity and representation from all of areas of this multidisciplinary field. That network is virtual, unpaid, and comes with no promises to the scientists. Still, NASA leaders point to it as an important experiment, and some interesting collabortions, proposals and workshops have come out of it. In addition, NExSS — along with the NASA Astrobiology Institute (NAI) and the National Science Foundation (NSF) — sponsored an unusual workshop this winter at Arizona State University focused on a novel way to looking at whether an exoplanet might support life. Astrophysicists and geoscientists spent three days discussing and debating how the field might gather and use information about the formation, evolution and insides of exoplanets to determine whether they might be habitable. NExSS has two more workshops coming up, one on “Biosignatures” July 27 t0 29 in Seattle and another on stellar-exoplanet interactions in November. Reflecting the broad reach of NExSS, the biosignatures program has additional sponsors include the NASA Astrobiology Institute (NAI), NASA’s Exoplanet Exploration Program (ExEP), and international partners, including the European Astrobiology Network Association (EANA) and Japan’s Earth-Life Science Institute (ELSI). Assuming for a moment that life exists on some exoplanets, how might researchers detect it? This is hardly a new question. More than ten years ago, competing teams of exo-scientists and engineers came up with proposals for a NASA flagship space observatory capable of identifying possible biosignatures on distant planets. No consensus was reached, however, and no mission was developed. But early this year, NASA Astrophysics Division Director Paul Hertz announced the formation of four formal Science and Technology Definition Teams to analyze proposals for a grand space observatory for the 2030s. Two of them in particular would make possible the kind of super-high resolution viewing needed to understand the essential characteristics of exoplanets. As now conceived, that would include a capability to detect molecules in distant atmospheres that are associated with living things. These two exo-friendly missions are the Large Ultraviolet/Optical/Infrared (LUVOIR) Surveyor and the Habitable Exoplanet (HabEx) Imaging Mission. Both would be on the scale of, and in the tradition of, scientifically and technically ground-breaking space observatories such as the Hubble and the James Webb Space Telescope, scheduled to launch in 2018. These flagship missions provide once in a decade opportunities to move space science dramatically forward, and not-surprisingly at a generally steep cost. Because the stakes are so high, planning and development takes place over decades — twenty years is the typical time elapsed between the conception of a grand flagship mission and its launch. So while what is happening now with the science and technology definition teams is only a beginning — albeit one with quite a heritage already — it’s an essential, significant and broadly-supported start. Over the next three years, the teams will undertake deep dives into the possibilities and pitfalls of LUVOIR and HabEx, as well as the two other proposals. There’s a decent chance that a version of one of the four will become a reality. Aki Roberge, an astrophysicist at the Goddard Space Flight Center and staff scientist of the LUVOIR study, said that the explicit charge to the teams is to cooperate rather than compete. Any of the four observatories under consideration, she said, would enable transformative science. But from an exoplanet perspective, the possibilities she described are pretty remarkable. The co-chair of the HabEx team, Bertrand Menneson of the Jet Propulsion Lab, said the goals are the same: A major jump forward in our ability to understand exoplanets and a serious effort to find life. The field of exoplanet detection and research has exploded over the past two decades, with an essential boost from increasingly capable observatories on Earth and in space. With at least three more major exoplanet-friendly space telescopes scheduled (or planned) for the next decade — as well as first light at several enormous ground-based mirrors — the brisk pace of discoveries is sure to continue. So why are so many scientists in the field convinced that a grand, Flagship-class NASA space observatory is essential, and that it needs to be developed and built ground-up with exoplanet research in mind? Can’t the instruments in use today, and planned for the next decade, provide the kind of observing power needed to continue making breakthroughs? Well, no, they can’t and won’t. That has been the conclusion of numerous studies over the years, and most recently an in-depth effort by the Association of Universities for Research in Astronomy (AURA) http://www.hdstvision.org/report which last summer called for development of a 12-meter (about 44 feet across) High Definition Space Telescope with the super high resolution needed to study exoplanets. Generally speaking, a larger light-collecting mirror allows astronomers and astrophysicists to see further and better. While we now have a small sample of potentially habitable planets around other stars, our current telescopes lack the power to confirm that these alien worlds are truly able to nurture life. This small crop of worlds may have temperate, hospitable surface conditions, like Earth. But they could instead be so aridly cold that all water is frozen, like on Mars, or so hot that all potential life would be suffocated under a massive blanket of clouds, like on Venus. Our current instruments cannot tell the difference for the few rocky planets known today, nor in general, for the larger samples to be collected in the future. Without better tools, we simply cannot see their atmospheres and surfaces, so our knowledge is limited to only the most basic information about the planet’s mass and/ or size, and an estimate of the energy reaching the top of the planet’s atmosphere. But if we could directly observe exoplanet atmospheres, we could search for habitability indicators (such as water vapor from oceans) or for signs of an atmosphere that has been altered by the presence of life (by searching for oxygen, methane, and/or ozone). A central goal for both LUVOIR and HabEx is to provide that “seeing” through much more sophisticated direct imaging — that is, capturing the actual reflected light from exoplanets rather than relying on indirect techniques and measurements. The many indirect methods of finding and studying exoplanets have played and will continue to play an essential role. But there is now a community consensus that next generation direct imaging from space is the gold standard. That a major space observatory for the 2030s just might be exoplanet-focused reflects a definite maturing of the field. From a science perspective, the discoveries of the Kepler mission in particular made clear that exoplanets are everywhere, and not infrequently orbiting in habitable zones. The work of the Curiosity rover on Mars, and especially the conclusion that the planet once was wet and “habitable,” added to the general interest and excitement about possible life beyond Earth. And then there are the lessons learned from the earlier bruising battles among exoplanet scientists, who had developed a reputation for serious in-fighting. THEIA, the Telescope for Habitable Exoplanets and Interstellar/Intergalactic Astronomy, was put forward as a flagship direct imaging mission in 2010, when the Astronomy and Astrophysics Decadal Survey that sets priorities for the field was being put together by the National Academy of Sciences. But THEIA was not adopted. When completed, the studies will go to the National Academy of Sciences for further review, discussion, and ultimately a recommendation to NASA regarding which project should go forward. The leader of the ExoPAG group was astronomer Scott Gaudi of Ohio State University, who specializes in characterizing exoplanets but played no favorites in the ExoPAG report and recommendations. I asked Gaudi if the seemingly substantial public interest in exoplanets could play any role in subsequent decision-making, and he replied that it possibly would. “In the past five or ten years, exoplanets have become a prominent topic for sure. And the public is clearly very, very interested in that topic.” But that public interest, he said, won’t mean much if the science and technical feasibility isn’t there. We won’t know for some years if the stars will align in a way that will lead to a major observatory with direct imaging and exoplanets at its center. But for those active in the field, the opportunity to take part in a major effort to formally determine its scientific merit and feasibility is irresistible. Shawn Domagal-Goldman, a research space scientist at Goddard, was selected to be a deputy on the LUVOIR science and technology team, which he sees as a much-anticipated “proof of concept” effort for the exoplanet research of the future. Between 12 and 18 scientists and engineers will be selected by NASA headquarters for each team, and Domagal-Goldman said it’s essential that they make up a broad and inter-disciplinary group, including people from industry. Scientists from abroad not associated with an American institution can’t be formal members, but they can observe and may become more involved if their national space agencies decide to join in the effort. He encourages researchers — from newly minted PhDs to career scientists — to nominate themselves to join. “Nobody gets paid for this, it’s a labor of love,” he said. “But what would be more satisfying than having some of your intellectual contribution go into the formulation of missions like these. Of course, it just might make the greatest discovery of modern science — finding life beyond Earth. We all know why. Exoplanets are just too small to directly image, other than as a miniscule fraction of a pixel, or perhaps some day as a full pixel. That leaves it up to artists, modelers and the travel poster-makers of the Jet Propulsion Lab to help the public to visualize what exoplanets might be like. Given the dramatic successes of the Hubble Space Telescope in imaging distant galaxies, and of telescopes like those on the Cassini mission to Saturn and the Mars Reconnaissance Orbiter, this is no small competitive disadvantage. While current detection methods have been successful in confirming more than 2,000 exoplanets in the past 20 years (with another 2,000-plus candidates awaiting confirmation or rejection), they have been extremely limited in terms of actually producing images of those planetary fireflies in very distant headlights. And absent direct images — or more precisely, light from those planets — the amount of information gleaned about the chemical makeup of their atmospheres as been limited, too. But despite the enormous difficulties, astronomers and astrophysicists are making some progress in their quest to do what was considered impossible not that long ago, and directly image exoplanets. In fact, that direct imaging — capturing light coming directly from the sources — is pretty uniformly embraced as the essential key to understanding the compositions and dynamics of exoplanets. That direct light may not produce a picture of even a very fuzzy exoplanet for a very long time to come, but it will definitely provide spectra that scientists can read to learn what molecules are present in the atmospheres, what might be on the surfaces and as a result if there might be signs of life. 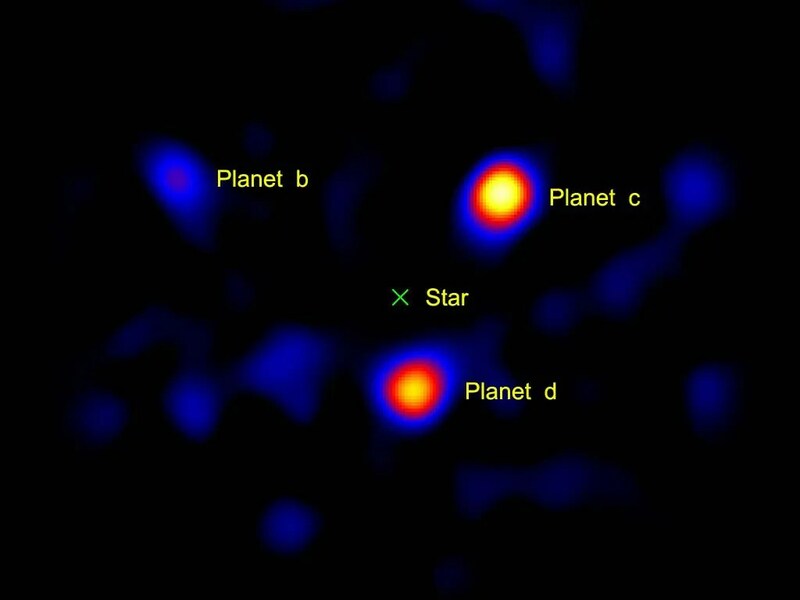 This diagram illustrates how astronomers using NASA’s Spitzer Space Telescope can capture the elusive spectra of hot-Jupiter planets. But a seemingly much more orderly strategy has been developed in recently years and was on display at the just-completed American Astronomical Society annual meeting in Florida. The most significant breaking news was probably that NASA has gotten additional funds to support a major exoplanet direct imaging mission in the 2020s, the Wide Field Infrared Survey Telescope (WFIRST), and that the agency is moving ahead with a competition between four even bigger exoplanet or astrophysical missions for the 2030s. The director of NASA Astrophysics, Paul Hertz, made the formal announcements during the conference, when he called for the formation of four Science and Technology Definition Teams to assess in great detail the potentials and plausibilities of the four possibilities. Paul Hertz, Director of the Astrophysics Division of NASA’s Science Mission Directorate. And the road to discovering exoplanets that might actually sustain life may well require a space-based telescope in the range of eight to twelve meters in radius, she and others are convinced. Considering that a very big challenge faced by the engineers of the James Webb Space Telescope (scheduled to launch in 2018) was how to send a 6.5 meter-wide mirror into space, the challenges (and the costs) for a substantially larger space telescope will be enormous. We will come back in following post to some of these plans for exoplanet missions in the decades ahead, but first let’s look at a sample of the related work done in recent years and what might become possible before the 2020s. 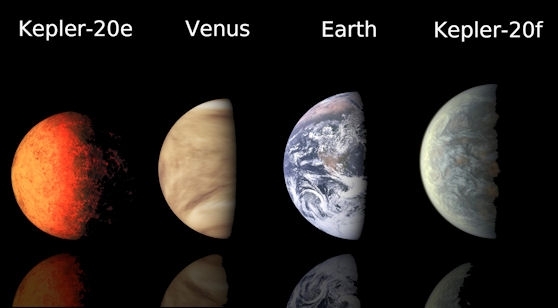 And since direct imaging is all about “seeing” a planet — rather than inferring its existence through dips in starlight when an exoplanet transits, or the wobble of a sun caused by the presence of an orbiting ball of rock (or gas) — showing some of the images produced so far seems appropriate. They may not be breath-taking aesthetically, but they are remarkable. There is some debate and controversy over which planets were the first to be directly imaged. But all agree that a major breakthrough came in 2008 with the imaging of the HR8799 system via ground-based observations. First, three Jupiter-plus gas giants were identified using the powerful Keck and Gemini North infrared telescopes on Mauna Kea in Hawaii by a team led by Christian Marois of the National Research Council of Canada’s Herzberg Institute of Astrophysics. That detection was followed several years later the discovery of a fourth planet and then by the release of the surprising image above, produced with the quite small (4.9 foot) Hale telescope at the Palomar Observatory outside of San Diego. That detection was followed several years later the discovery of a fourth planet and then by the release of the surprising image above, produced with the quite small (4.9 foot) Hale telescope at the Palomar Observatory outside of San Diego. As is the case for all planets directly imaged, the “pictures” were not taken as we would with our own cameras, but rather represent images produced with information that is crunched in a variety of necessary technical ways before their release. Nonetheless, they are images in a way similar the iconic Hubble images that also need a number of translating steps to come alive. Because light from the host star has to be blocked out for direct imaging to work, the technique now identifies only planets with very long orbits. In the case of HR8799, the planets orbit respectively at roughly 24, 38 and 68 times the distance between our Earth and sun. Jupiter orbits at about 5 times the Earth-sun distance. In the same month as the HR8799 announcement, another milestone was made public with the detection of a planet orbiting the star Formalhaut. That, too, was done via direct imagining, this time with the Hubble Space Telescope. Signs of the planet were first detected in 2004 and 2006 by a group headed by Paul Kalas at the University of California, Berkeley, and they made the announcement in 2008. The discovery was confirmed several years later and tantalizing planetary dynamics began to emerge from the images (all in false color.) For instance, the planet appears to be on a path to cross a vast belt of debris around the star roughly 20 years from now. If the planet’s orbit lies in the same plane with the belt, icy and rocky debris could crash into the planet’s atmosphere and cause interesting damage. The region around Fomalhaut’s location is black because astronomers used a coronagraph to block out the star’s bright glare so that the dim planet could be seen. This is essential since Fomalhaut b is 1 billion times fainter than its star. The radial streaks are scattered starlight. Like all the planets detected so far using some form of direct imaging, Fomalhaut b if far from its host star and completes an orbit every 872 years. Adaptive optics of the Gemini Planet Imager, at the Gemini South Observatory in Chile, has been successful in imaging exoplanets as well. The GPI grew out of a proposal by the Center for Adaptive Optics, now run by the University of California system, to inspire and see developed innovative optical technology. Some of the same breakthroughs now used in treating human eyes found their place in exoplanet astronomy. The GPI grew out of a proposal by the Center for Adaptive Optics, now run by the University of California system, to inspire and see developed innovative optical technology. Some of the same breakthroughs now used in treating human eyes found their place in exoplanet astronomy. The Imager, which began operation in 2014, was specifically created to discern and evaluate dim, newer planets orbiting bright stars using a different kind of direct imaging. It is adept at detecting young planets, for instance, because they still retain heat from their formation, remain luminous and visible. Using the GPI to study the area around the y0ung (20-million-year-old) star 51 Eridiani, the team made their first exoplanet discovery in 2014. By studying its thermal emissions, the team gained insights into the planet’s atmospheric composition and found that — much like Jupiter’s — it is dominated by methane. 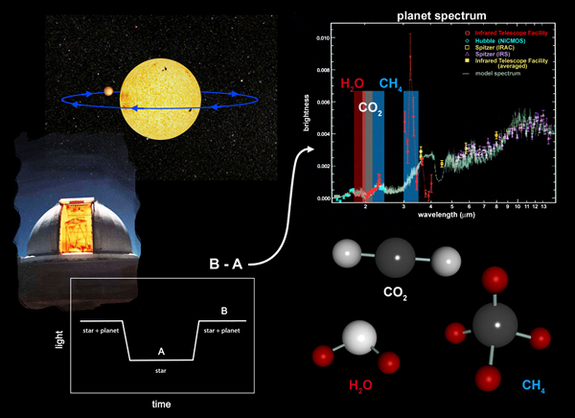 To date, methane signatures have been weak or absent in directly imaged exoplanets. James Graham, an astronomer at the University of California, Berkeley, is the project leader for a three-year GPI survey of 600 stars to find young gas giant planets, Jupiter-size and above. “The key motivation for the experiment is that if you can detect heat from the planet, if you can directly image it, then by using basic science you can learn about formation processes for these planets.” So by imaging the planets using these very sophisticated optical advances, scientists go well beyond detecting exoplanets to potentially unraveling deep mysteries (even if we still won’t know what the planets “look like” from an image-of-the-day perspective. A next big step in direct imaging of exoplanets will come with the launch of the James Webb Space Telescope in 2018. While not initially designed to study exoplanets — in fact, exoplanets were just first getting discovered when the telescope was under early development — it does now include a coronagraph which will substantially increase its usefulness in imaging exoplanets. As explained by Joel Green, a project scientist for the Webb at the Space Telescope Science Institute in Baltimore, the new observatory will be able to capture light — in the form of infrared radiation– that will be coming from more distant and much colder environments than what Hubble can probe. These capabilities and more are going to be a boon to exoplanet researchers and will no doubt advance the direct imaging effort and potentially change basic understandings about exoplanets. But it is not expected produce gorgeous or bizarre exoplanet pictures for the public, as Hubble did for galaxies and nebulae. Indeed, unlike the Hubble — which sees primarily in visible light — Webb sees in what Green said is, in effect, night vision. And so researchers are still working on how they will produce credible images using the information from Webb’s infrared cameras and translating them via a color scheme into pictures for scientists and the public. Another compelling exoplanet-imaging technology under study by NASA is the starshade, or external occulter, a metal disk in the shape of a sunflower that might some day be used to block out light from host stars in order to get a look at faraway orbiting planets. MIT’s Sara Seager led a NASA study team that reported back on the starshade last year in a report that concluded it was technologically possible to build and launch, and would be scientifically most useful. If approved, the starshade — potentially 100 feet across — could be used with the WFIRST telescope in the 2020s. The two components would fly far separately, as much as 35,000 miles away from each other, and together could produce breakthrough exoplanet direct images. The answer, then, to the question posed in the title to this post — “How Will We Know What Exoplanets Look Like, and When?”– is complex, evolving and involves a science-based definition of what “looking like” means. It would be wonderful to have images of exoplanets that show cloud formations, dust and maybe some surface features, but “direct imaging” is really about something different. It’s about getting light from exoplanets that can tell scientists about the make-up of those exoplanets and their atmospheres, and ultimately that’s a lot more significant than any stunning or eerie picture. And with that difference between beauty and science in mind, this last image is one of the more striking ones I’ve seen in some time. It was taken at the Las Campanas Observatory in Chile last year, during a night of stargazing. Although the observatory is in the Atacama Desert, enough moisture was present in the atmosphere to create this lovely moon-glow. But working in the observatory that night was Carnegie’s pioneer planet hunter Paul Butler, who uses the radial velocity method to detect exoplanets. But to do that he needs to capture light from those distant systems. So the night — despite the beautiful moon-glow — was scientifically useless. The study of exoplanets – planets around other stars – is a relatively new field. The discovery of the first exoplanet around a star like our sun was made in 1995. Since the launch of NASA’s Kepler space telescope six years ago, more than 1,000 exoplanets have been found, with thousands of additional candidates waiting to be confirmed. 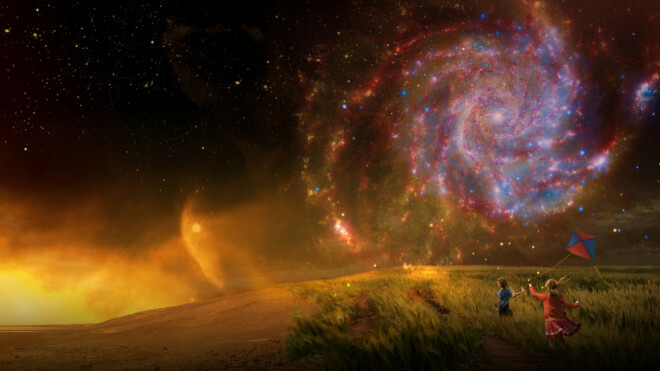 Scientists are developing ways to confirm the habitability of these worlds and search for biosignatures, or signs of life. The Transiting Exoplanet Survey Satellite (TESS) is working toward a 2017 launch, with the James Webb Space Telescope (JWST) scheduled for launch in 2018. The Wide-field Infrared Survey Telescope is currently being studied by NASA for a launch in the 2020’s. Daniel Apai leads the Earths in Other Solar Systems team from the University of Arizona. The EOS team will combine astronomical observations of exoplanets and forming planetary systems with powerful computer simulations and cutting-edge microscopic studies of meteorites from the early solar system to understand how Earth-like planets form and how biocritical ingredients — C, H, N, O-containing molecules — are delivered to these worlds. Researchers from Hampton University will be exploring the sources and sinks for volatiles on habitable worlds. The Living, Breathing Planet Team, led by William B. Moore, will study how the loss of hydrogen and other atmospheric compounds to space has profoundly changed the chemistry and surface conditions of planets in the solar system and beyond. This research will help determine the past and present habitability of Mars and even Venus, and will form the basis for identifying habitable and eventually living planets around other stars. The Yale University team, headed by Debra Fischer, will design new spectrometers with the stability to reach Earth-detecting precision for nearby stars. The team will also make improvements to Planet Hunters, http://www.planethunters.org, a web interface that allows citizen scientists to search for transiting planets in the NASA Kepler public archive data. Citizen scientists have found more than 100 planets not previously detected; many of these planets are in the habitable zones of host stars. Artist’s conception of Kepler-186f, the first validated Earth-size planet to orbit a distant star in the habitable zone. The search for life beyond our solar system requires unprecedented cooperation across scientific disciplines. NASA’s NExSS collaboration includes those who study Earth as a life-bearing planet (lower right), those researching the diversity of solar system planets (left), and those on the new frontier, discovering worlds orbiting other stars in the galaxy (upper right). NASA is enlisting teams of scientists around the nation, including a group from Yale, to collaborate on a new approach for finding life on planets outside our solar system. The joint effort is called Nexus for Exoplanet System Science (NExSS), and it will create a “virtual institute” of scientists from 10 universities, three NASA centers, and two research institutes. NASA selected teams based on proposals from across NASA’s Science Mission Directorate. Yale astronomy professor Debra Fischer will lead a team that is building new spectrometers with the stability and precision to detect Earth-like planets orbiting nearby stars. A critical part of the team’s work involves new statistical techniques to distinguish “noise” — velocities in the photospheres of the stars — from the reflex velocities induced by planets. Fischer’s team also will continue to enlist amateur astronomers to search NASA’s Kepler public archive data for exoplanets, which are planets orbiting around other stars. Fischer has been at the forefront of citizen science efforts to search for exoplanets via the Planet Hunters program. Citizen scientists have found more than 100 transiting exoplanets not previously detected. Many of these planets orbit in the habitable zones of their host stars. Fischer’s team also is analyzing the planet occurrence rates for different types of stars. Since the launch of NASA’s Kepler space telescope six years ago, more than 1,800 exoplanets have been confirmed. There are thousands more exoplanet candidates waiting for confirmation. In order to determine the habitability of these planets and look for signs of life on them, NExSS will coordinate scientific research into the various components of exoplanets. It’s a “system science” approach to understanding how biology interacts with the atmosphere, geology, oceans, and interior of a planet, and how the host star affects these interactions. NExSS will draw from the scientific expertise in each division of NASA’s Science Mission Directorate. Earth scientists will develop a systems science approach by studying our home planet; planetary scientists will look at other planets in our solar system; heliophysicists will study how the Sun interacts with orbiting planets; and astrophysicists will provide data on exoplanets and host stars. NExSS will be led by scientists from the NASA Ames Research Center, the NASA Exoplanet Science Institute at the California Institute of Technology, and the NASA Goddard Institute for Space Studies.